Chung Ho-kyoon, vice president of Samsung SDI Co, explains what he says is the world's largest next-generation display for personal computers and notebooks in Seoul. 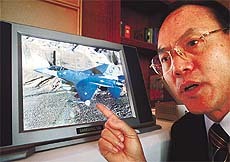 Chung said Samsung SDI was the first to produce the 15.1-inch model for active matrix organic electro luminescence display, which offers better colours and clearer pictures. 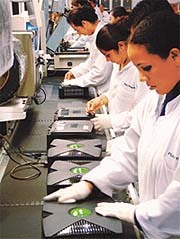 Workers at Flextronics' Xbox manufacturing facility in Guadalajara, Mexico, put the final touches on the Xbox video game systems as they roll off the lines for shipment to retail stores across North America, in this undated publicity photograph. The future-generation game console from Microsoft will hit store shelves on November 15, 2001, along with 15-20 game titles. 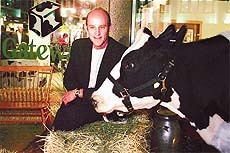 Ted Waitt, CEO of Gateway Computers sits with a cow outside of the Gateway country store in New York. Waitt was at the store to celebrate the retail availability of Microsoft's Windows XP operating system. The black and white cow markings are used in Gateway's logo and boxes. 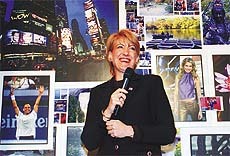 Carly Fiorina, CEO and president of HP computers, talks at a digital photo exhibition at the Metropolitan Museum of Art . The exhibit was sponsored by HP to show how the new Windows XP operating system works with digital photography.